Coos, Giggles and moves her legs when you tickle her tummy. (BRAND NEW, in original box, never opened). 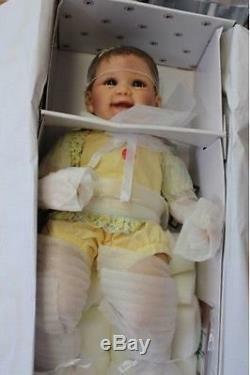 This exclusive collectible Tummy Tickles Baby Doll from The Ashton-Drake Galleries features. Capture the delight of tickle time with the So Truly Real® Tummy Tickles Baby Doll by Linda Murray, she giggles, coos and wiggles her legs and she is exclusively from The Ashton-Drake Galleries. She responds to your touch! This interactive cutie is a touch-activated doll who coos, giggles and kicks her tiny legs in delight when you tickle her tummy. Sculpted for incredible realism by Master Doll Artist Linda Murray, this lifelike baby doll is cast in soft RealTouch® vinyl with hand-painted features and soft wisps of baby-fine hair. She comes to you wearing a sweet yellow romper adorned with baby blue trim and a pretty floral design on the collar, sleeves and ruffle, with a pretty yellow bow in her hair. Requires 3 "AA" batteries (not included). Measure approximately 18 L; 45.7 cm L. The item "So Truly Real ASHTON DRAKE TUMMY TICKLES Touch Activated Lifelike Baby Doll NEW" is in sale since Sunday, July 10, 2016.